From the streets and playgrounds of Brooklyn, to the nightclubs and restaurants of the Sunset Strip and the Las Vegas Strip, food writer and political consultant Larry Levine shares warm, tender, funny and inspirational stories along with 104 delectable recipes for the home cook in his memoir, “Cooking for a Beautiful Woman: The Tastes and Tales of a Wonderful Life” (published by Archway Press). The book weaves together stories of strong, intelligent, independent and witty women – singers and secretaries, classmates and teachers, actresses and attorneys, mothers, daughters, granddaughters, friends, lovers and mentors – with recipes from more than 20 ethnic and cultural backgrounds. 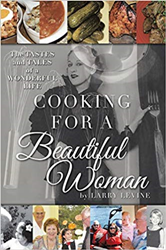 The book is available for purchase at: https://www.amazon.com/Cooking-Beautiful-Woman-Tastes-Wonderful/dp/1480864609. Larry Levine lives in Los Angeles with his wife, Jennifer. They have two sons and four grandchildren. He was born in Brooklyn and moved to Los Angeles when he was 10 years old. Levine is a lifelong fan of baseball, food, opera and the musical comedy stage. He also is an avid golfer. Levine estimates he has prepared some 30,000 meals for family and friends. He is editor and publisher of the online food and restaurant magazine Table Talk at Larry’s. He has been an award-winning political consultant for 49 years.